282 pages | 1 B/W Illus. Democratic legal systems have recently been subject to rapid and multi-directional processes of change. There are numerous sociological, technological, ideological, or purely political processes which result in law’s amendment and transformation. This book argues that this legal change is best understood from a political philosophy perspective. This can be used as an interpretative device to understand the ongoing processes of change as well as their outcomes such as new laws, judicial interpretations or constitutional amendments. 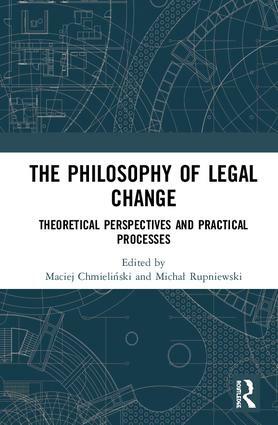 The work has three main objectives: to provide deeper understanding of the problems of legal change within the diversity of Western political and legal thought; to examine the development of the processes of change in terms of their normative and prudential acceptability; to interpret actual processes of change with a view to the general theoretical and normative background. The book is divided into three parts: Part I sets the scene and is focused on the general issues important for understanding and evaluating legal change from the perspective of political philosophy. Part II focuses on the spectrum of politico-philosophical justifications present in the political culture of democratic states. Part III offers selected case studies to specify and apply the philosophical ideas in the previous parts. The book will be a valuable resource for students and scholars of law and jurisprudence, including comparative legal studies and human rights law, political theory, and philosophy. Michal Rupniewski is Assistant Professor of Law and Philosophy at the University of Lódz, Branch in Tomaszów Mazowiecki, Poland. Maciej Chmielinski is Professor of Law, member of the Department of Political and Legal Doctrines and the Alexis de Tocqueville Center for Political and Legal Thought within the Faculty of Law and Administration at the University of Lódz.